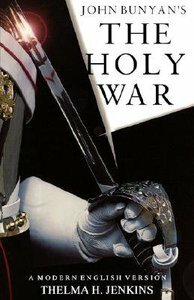 This modern English version of Bunyan's allegorical classic, THE HOLY WAR succeeds in retaining the beauty of his style, communicating scriptural truth with an exciting story that will be enjoyed by young and old. The Holy War is considered by many to be amongst John Bunyan's best writings. The allegory portrays the continuous conflict between man and the devil. This is an extremely gripping story which, in its present form, will be appreciated by both young and old, Christian and non-Christian. After the Bible, Pilgrim's Progress by John Bunyan is still one of the world's best sellers. The Holy War, his other allegorical work, portrayed the continuous conflict between man and the devil. The city of Mansoul is attacked by Diabolus using ruse, intrigue and force. The battle is long and bitter, but through the intervention of Prince Emmanuel victory is secured, in spite of the weaknesses and failings of the inhabitants of Mansoul. This modern English version succeeds in retaining the beauty of Bunyan's style, presenting scriptural truth and telling an exciting story which will be enjoyed by young and old.